Wigan missed a chance to move into League One's automatic promotion places after being held by struggling Oldham. 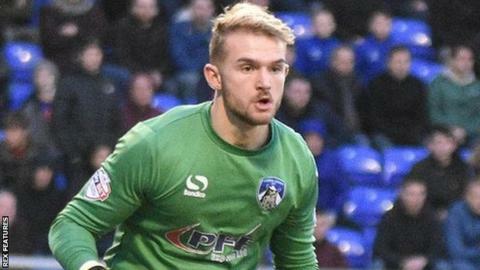 Oldham goalkeeper Joel Coleman denied Will Grigg a winner by saving his close range effort late on. The stalemate sees Wigan drop to fourth whilst Oldham remain in 23rd place. "Probably didn't deserve a point in the end. Oldham played very well and caused us a lot of problems. "We have to be thankful that we did get the point. "We can't accept performances like that and we have to do something about it quickly." "I'm tremendously proud of the players, the way they've come to probably the best team at this moment in time in our league. To come and perform like we did was quality from the lads. Every game we go into, we're going to try and win. "Every player on the pitch played really well today, and it's down to the players at the end of the day." Match ends, Wigan Athletic 0, Oldham Athletic 0. Second Half ends, Wigan Athletic 0, Oldham Athletic 0. Corner, Oldham Athletic. Conceded by Max Power. Attempt missed. Carl Winchester (Oldham Athletic) right footed shot from the right side of the box is close, but misses the top right corner. Attempt missed. William Grigg (Wigan Athletic) left footed shot from outside the box is close, but misses the top left corner. Corner, Wigan Athletic. Conceded by Cameron Dummigan. Attempt missed. Ryan Colclough (Wigan Athletic) header from the right side of the box misses to the right. Attempt saved. William Grigg (Wigan Athletic) right footed shot from the left side of the box is saved in the centre of the goal. Foul by Ryan Colclough (Wigan Athletic). Attempt saved. Yanic Wildschut (Wigan Athletic) right footed shot from a difficult angle on the left is saved in the bottom right corner. Corner, Oldham Athletic. Conceded by Jussi Jääskeläinen. Attempt saved. Daniel Lafferty (Oldham Athletic) right footed shot from very close range is saved in the top right corner. Attempt missed. Matthew Palmer (Oldham Athletic) right footed shot from outside the box is close, but misses to the left. Substitution, Wigan Athletic. Ryan Colclough replaces David Perkins. Substitution, Oldham Athletic. Lee Croft replaces Rhys Murphy. Conor McAleny (Wigan Athletic) wins a free kick on the left wing. Foul by Daniel Lafferty (Oldham Athletic). Attempt saved. Yanic Wildschut (Wigan Athletic) right footed shot from outside the box is saved in the centre of the goal. Matthew Palmer (Oldham Athletic) wins a free kick on the right wing. Reece Wabara (Wigan Athletic) wins a free kick on the left wing. Second Half begins Wigan Athletic 0, Oldham Athletic 0. Substitution, Wigan Athletic. Sam Morsy replaces Donervon Daniels.